There are many aspects of skateboarding that make it such a awesome thing, one of these is the opportunity to meet so many people and make so many awesome friends! We’re all in this crazy world together and its not something that those who don’t skate can understand. 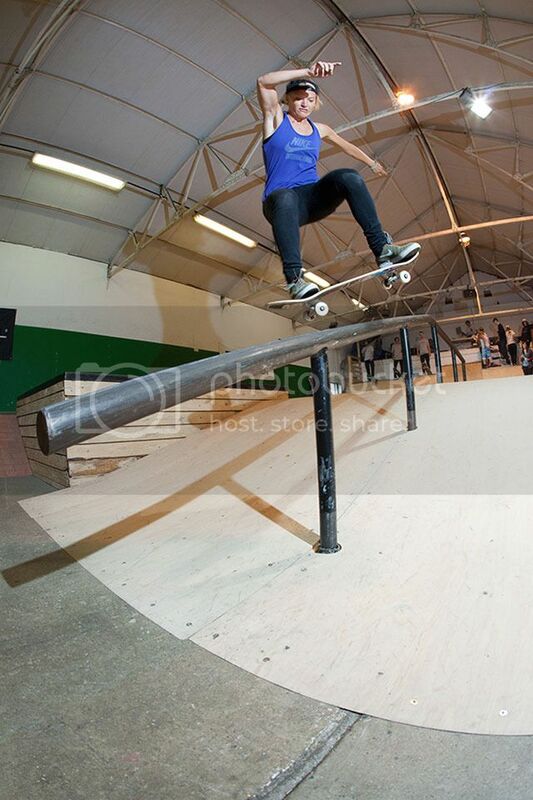 I think this is why the female skateboarding world is so awesome, it might be small but it’s awesome. I met Julia Bruckler at the Kimberly diamond Cup in South Africa, we got chucked in the deep end, we’d never met each other before and were going to share a room for the next 10 days. It was awesome, she’s a legend both on and off the board, this month I thought I’d give ya’ll a little insight into Julia Brucklers world, get excited dudes, this is the future of ladies skateboarding! For those that don’t know, where are you from? I’m from a little town called Gerasdorf close to Vienna, Austria. What’s it like growing up in Austria? It’s actually really nice. Austria is right in the middle of Europe so you can drive to 5 different countries like Italy or Germany within a few hours. According to studies Vienna is one of the best cities to live in in the world,I guess that’s because good infrastructure, health system and very little pollution but for skating there are a lot better cities in Europe. Does the weather effect skating? Yes. From November to March it’s pretty cold and snows quite often, luckily I work in an indoor skate park so I get to skate nearly everyday. Are there many female skaters there? When I started skating it was just me for a couple of years, but the scene is definitely growing now. Whats a normal day like for you? I get up, drive to work and give a few skateboarding classes. I do some emails and business stuff and work till late afternoon. In summer I often hit some streetspots afterwards or just go and chill at a park. You’re the most motivated female skater I have ever met! Are you always motivated to skate or dose it change from time place or experiance? Yeah, I just love skating, I guess if my body would allow it, I’d skate like 10 hours 7 days a week. I don’t need much to get motivated. I watch a lot of clips and videos, but usually a nice spot, good weather and my friends are the best motivation. I think everyone falls in love with skating for different reason. When I was in middle school, all the cool guys were skaters. One day they let us girls try as well and somehow I managed to ollie more or less first try – then I instantly fell in love with it. Do you get more hyped when you’re on a trip? Yes, of course. You can skate the spots in your hometown all the time but when you go somewhere you only got a short amount of time to skate awesome new spots, so I always try to make the best of it. You have a massive trick selection is that something you push yourself with? You skated Kimberly diamond Cup, X-games, Mystic Cup, UK girls skate jam, Back to to Streets in Poland, O’Marisquiño in Spain and Get Set Go in Sweden last year, Do you love traveling around, is it something that’s on the cards for this year too? I really enjoy travelling. I love to see new places, meet new people and skate different spots, so I try to travel as much as I can. You do alot of comps do you find it hard to adapt when up againts the best in the world? How do you keep the nerves down? Competitions are always both fun and stressfull at the same time. I try to focus just on myself an my abilities, that has really helped me a lot in the past. How do you feel about the difference in wages in female and male skating? In general men and women should always get same wages whatever they do. On the other side I understand that companies are not ready to invest the same amount of money in female skateboarding cause it’s still comparatively small, which is a pity cause if they would do more “promotion” I guess the scene would grow even faster. It defiantly seems like there is an awesome female skate scene in Europe, do you guys go on trips together or is everyone pretty spread out?We’re actually planning a trip this summer. Usually we meet somewhere to skate a comp and go skating and filming together afterwards. Any tips for Australian girls planning to travel Europe on a skate mission? Go to Barcelona, it is definitely worth it! Sadly with skateboarding injuries will happen. You had some long term ones that you were skating through, how’s that all going now? I ruptured two ligaments (ankle) last year and finally had surgery by the end of December. I couldn’t skate for 6 weeks (I just did manuals on flat cause I couldn’t resist) but had a textbook rehabilitation according to my physio therapist. Luckily everything’s alright now and I’m really looking forward to the new season! Any advice for skaters dealing with long term injuries trying to get back on board? Do your exercises, even after you think that you have already recovered! Don’t start with difficult stuff too early and always remind yourself it’s worth waiting because it is going to be better at some point. What sponsors you riding for at the moment? Well I hope at some point you can make it out to Australia, would love to have you out here! Keep shredding. I spent a month in Sydney when I was still in school and I absolutely loved i,. I really hope I can go back someday!